vinnys is known as the poineer of the transport services . Vinnys Executive Travel currently holds a National licence. "The driver was on time both to Preston & back. He was friendly & contactable on his mobile. The vehicle was not the youngest model, but clean & up to the job. Options to listen to music (USB port for phone or similar - or even just radio) would be great. The booking was easy & the fee very reasonable - happy to recommend Vinny’s"
"Boss. Arrived on time, let us have a drink on the minibus. Let us stop for bathroom breaks. Lovely man." "Arrived in time. Happy to change pick up. Cost was very reasonable." "Driver reliably turned up on time going out and coming back at 1am - much appreciated. Our party of 8 swelled to a party of 14 coming back due to another minibus not turning up at the venue and they were easily accommodated on the minibus. On the return journey I got out early and paid the driver in full and gave him a decent tip (£10 on top of the £180 agreed for the round journey). He later went on to charge my colleagues a further £60 after I had left - a little mean perhaps considering I had paid in full 0.5 mile earlier and it was not something agreed when taking on the extra passengers." 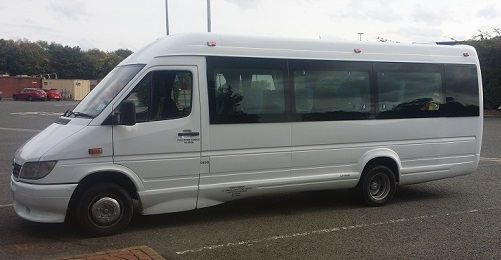 "Our minibus arrived on time with no issues. Our driver was very friendly and polite." "Vinny was spot on time. He was very pleasant and helpful. He was very accomadating and picked us up at a different location for our return. Both mini buses used were spotless and comfortable. Would most definately use him again." "We had a great day out with Vinny's Executive Travel and we shall certainly be booking with them again. Despite road works and a short delay caused by a member of our group, the driver was patient and helpful. He kept to time and the service was excellent." "Very good throughout the driver , the vehicle was great"
"Lovely drivers. Vehicles were perfect for our needs. Very accommodating for stopping/dropping off!"